Ed Sheeran is giving fans a very personal peek into his childhood and teen years in the video for "Photograph." 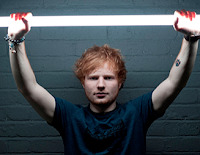 Sheeran premiered the video on May 9 and it features clips of the 24-year-old singer as a baby, toddler and beyond-- all the way up to his current life as a pop star playing in front of massive crowds. The video opens with footage of Sheeran as a tiny baby. But some of the coolest images are of him as a little kid playing various instruments, which just goes to prove he's been musically inclined from a young age.